A fascinating bit of travel trivia for you. Did you realize that flights take off and land from LAX all night? I know this for a certainty from first-hand experience. So it is that I find myself awake at three in the morning at the Westin LAX. For those not familiar with LAX, there is a line of hotels right off one of the runways in this airport-city. My latest travels take me to Southern California to visit a client. 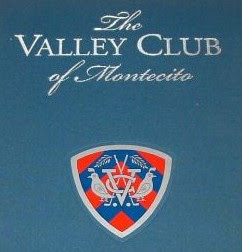 As it turns out, I was also able to fit in a round of golf at The Valley Club of Montecito (ranked #85 in the world). The Valley Club is located about 1 1/2 hours north of Los Angeles in Montecito, an un-incorporated part of Santa Barbara. It is situated between the Pacific Ocean and the Santa Ynez Mountains. This particular itinerary also had me flying on Alaska Airlines for the first time from Palm Springs to San Francisco, then home. My itineraries can be complex when I need to plan around fitting in a round of golf, but I do it gladly. It will also be my last time flying Alaska Airlines, who have not yet perfected the art of on-time departures and they committed the cardinal sin for a golfer - they lost my clubs. Luckily it was on the way home so it didn't impact my play at The Valley Club. For those not familiar with the topography of California, a quick lesson. The entire state has a series of mountain ranges running through it from north to south. These 'transverse ranges' are one of the defining features of the state. The majority of California's population lives squeezed in between these various mountains and the Pacific Ocean. I digress into geography because it is important to understand when playing at The Valley Club. 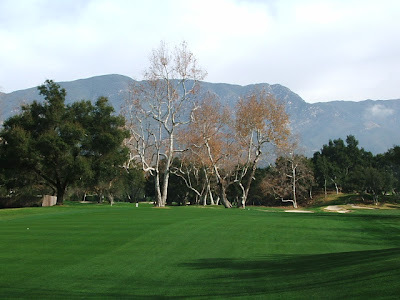 The course is situated between the Pacific Ocean and the Santa Ynez mountains. This means you always have to take into account the impact both the ocean and the mountain will have on your putts. Putts break toward the ocean and away from the mountain. I had several putts that were clearly uphill but played downhill because they were coming off the mountain, toward the ocean. Knowing where you are in relation to the mountain is a non-trivial matter here and dominates your selection of line and pace on every green. It really takes some getting used to. Why is The Valley Club on the top 100 list? In two words: Alister MacKenzie. The Valley Club was designed in 1929 by Alister MacKenzie and Robert Hunter. 1929 was at the height of MacKenzie's output, having completed Augusta National the same year and Cypress Point the year prior. One of the defining characteristics of The Valley Club are the signature MacKenzie greens. In addition to the subtle breaks and the mountain/ocean effect, the greens are also small. Like at another MacKenzie course, Crystal Downs, I found putting here difficult. The other key feature of The Valley Club are the MacKenzie-designed bunkers, which he works into the course with his 'camouflage' effect very skillfully. Many are optical illusions. Often, what looks to be a greenside bunker is actually set back from the green. The first two holes and the last six holes play near the clubhouse. Holes three through twelve play across Sheffield Road and essentially in a little isolated canyon. You can get a good feel for the terrain at The Valley Club from the shot below, which is looking back to the tee box from the green at the 14th. 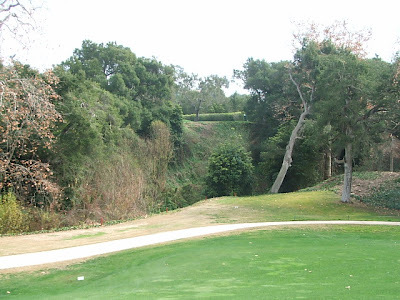 You hit your tee shot on this par three downhill over a barranca. I thought the best hole on the course is the 9th hole, a dog-leg right that plays from an elevated tee. If you hit your shot far enough to the left you have a good, but long, shot to an elevated green over a creek. The green and its bunkers slope severely down a hill. To the left of the green is a horse-farm, consistent with aristocratic nature of the neighborhood here. I did not play the hole that well, which is a shame, since it is such a good hole. I hit my approach long into one of the greenside bunkers above the hole. A downhill-fried-egg-lie-to-a-small-green is not in my repertoire of shots. The next three holes (10-11-12) all play in the same direction and are also quite good since you are playing along the canyon on the left with beautifully designed, sloping holes protected by camouflage bunkers and small greens. I was fortunate to play at The Valley Club on a beautiful winter morning. The course is one of the best conditioned I have ever played and it was an ideal round. We were one of only a half-dozen groups on the course. At 225 members, The Valley Club doesn't get a lot of play. This is golf as it was meant to be played, in my opinion. We walked and had nobody in front of us, nobody behind us, there was no waiting, and we played briskly in the beautiful weather. I will once again state how fortunate I am indeed to be lucky enough to play golf in idyllic places such as this. I started the day wearing a sweater due to the morning fog which is common along the California coast. By the fourth hole, the fog had burned off and we played the remainder of the round in polo-shirts. The beauty of the place is evident from the picture below showing the sculpted trees against the mountain backdrop. I got a lesson in tree-spotting at The Valley Club. A traditionalist type of place, like both Pine Valley and Ganton, the sprinkler heads are not marked and there are no other identifying marks. You get a little card (seen below) that tells you the yardages from various landmarks on the course. If you can distinguish an oak tree from a sycamore from a cypress/pine you're in good shape. I was OK until one hole was marked with a 'forked' tree, which I couldn't make heads or tails out of. I'm used to reading putting greens. Reading trees took some getting used to. 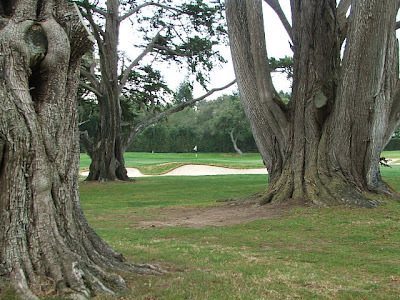 I did become quite familiar with the Cypress trees, with their distinctive trunks, near the 16th green, below, when I hooked my second shot left of the green. The course was launched right before the Great Depression and immediately ran into hard times. Hard being a relative term in Montecito, you understand. In any event, during the second world war they allowed livestock to graze on the holes across Sheffield Road - more than half the course. It became overgrown and was also used for Victory Gardens. It was restored in 1946. 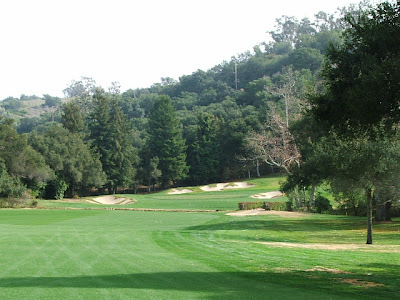 In 1997, The Valley Club hired Tom Doak to update their master plan and refresh the course. In a testament to both the original strength of the design of Mackenzie and Hunter and to Doak's restraint in messing about with a gem, only minor changes were made to some greens and bunkers. The Valley Club proved a difficult course to gain access to, it took me about three years of trying to get on. The Valley Club is a privileged club in the middle of a prosperous and aristocratic community. Montecito is an extremely well-to-do enclave. The course is surrounded by gated-entrance mansions, most with screening hedge-rows. I like to research each club and destination as part of my travels. Santa Barbara was routinely described as "among the wealthiest communities in the U.S." The market research firm Claritis classifies it as "upper-crust", which is their highest affluent ranking. According to Forbes Magazine Montecito is one of the top 20 wealthiest zip codes in the United States and ranks ahead of such high-end locales as Beverly Hills, Bel Air and Pebble Beach. The affluence of the area is reflected in the understated but tony clubhouse with its old locker room with its original wooden lockers that have developed a nice patina. Quite a cozy little place to have a post-round drink overlooking the Pacific Ocean. 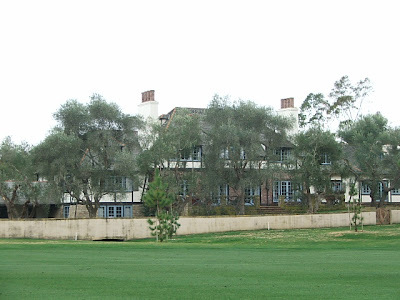 To give you a flavor for the housing surrounding The Valley Club, see the picture below of a house off the 17th fairway, reminiscent of two other Southern California gems, Los Angeles Country Club and Bel-Air. California has a reputation as being one of the most liberal and left-leaning states in the Union. I'm sure it is, however, this quest is taking me to all its conservative strongholds (Los Angeles County Club, San Francisco Golf Club and now The Valley Club). Thus far on my golf travels I have not yet seen the liberal California. Santa Barbara is an old-money conservative town and this is reflected in the makeup of its membership. This is Reagan Country, the 40th President had strong roots in the area and his presidential library is located not too far away in the Simi Valley. Not many granola-eaters or tree-huggers around here. The club has traditionally defended itself by protecting its right to do as it pleases and to be different. From the club president in the difficult war year of 1944, "Certain evidences of wear and tear merely suggest the homey lived-in atmosphere so rarely seen today. 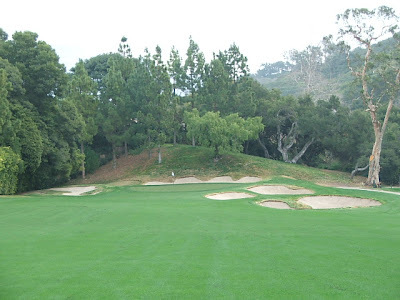 It is the only club in Santa Barbara where members can still find an uncrowded golf course, good food, proper service and privacy. It was organized to provide these features which are only obtainable in a small club". So little has changed from when this was written it may as well have been written last week. I enjoyed my day at The Valley Club quite a bit and agree with its place in the rankings at #85. I have now completed playing five of the seven courses I need to in California and look forward to one day playing MacKenzie's other California course - Cypress Point. My trip was completed by a requisite visit to an In-N-Out Burger, one of the fringe benefits of freqent travel. Not normally an eater of fast-food, I can't resist their old fashioned, high-quality burgers and shakes. In one of the great food mysteries of our time, I can't figure out why In-N-Out hasn't made it east of the Rocky Mountains? In-and-Out Burgers never made it east of the Rockies becasue the owners of the company will not allow their hamburger patties travel for more than one day from So Cal. And I will bet you that the In and Out Burger that you ate at was in Camarillo. Played the course back in 1983... it is one of my favortie memories, along with playing Sandpiper. BTW... I have ruined many a golf shirt eating a Double-Double with extra onions as I sat in the back of the car on our way home from any and many a round of golf. A friend who plays there a lot says of the tree-based yardage guide: "You have to be a f#&%ng arborist to play this course!" Too true. 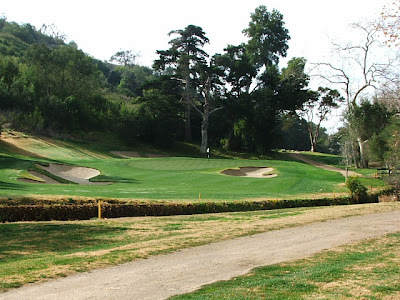 MacKenzie actually designed another course in California, Pasatiempo Golf Course in Santa Cruz. It's great layout open for public play. And there's an In-N-Out Burger not too far away. My brother is a member and is actually the one that got Fred Couples accepted as a new member (it's almost impossible to join the club, which as you state is limited to 225 members). What I remember most about playing the course is that you can simply walk off the fairway into the bushes and see brand-new Titleists sitting there waiting to be picked up. Apparently, the uber-rich members can't be bothered to look for their balls off the fairways and simply play Mulligans. Regarding In-N-Out Burgers, I once read a post from a woman that said the only thing she missed about California was In-N-Out. Amen. I just discovered your blog and glad I did. I've been researching great golf courses for days now after coming back from a trip in Scotland where I played Royal Dornoch (twice!). If you have not played it yet, you haven't been to golf heaven here on Earth. Although I live in Boston now (north shore area...actually Donald Ross heavy with courses) I grew up in Santa Barbara and played in the SB Junior Golf Tour program in the summers. Just prior the end of summer junior championship, we played Vally Club. I loved it instantly the first time and I played it. And it would become my first junior tournament win site when at age 17 I played the entire back nine even par for a 74 total. One of the greatest days of my life. I am a Dr. Alister MacKenzie fan (nut is probably more accurate) and had a fascination with golf course architecture since 13. Needless to say, after my winning 74 round, I drew the entire course from memory with my shots shown in dashed line-to-point method. I have studied the great courses much more than played them, but I am happy to see Vally Club on your top 100 list. You are right about the greens...they are beguiling to read and the course as pristine as golf gets.